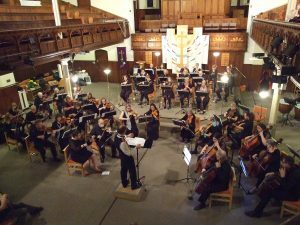 The Clarendon Park Orchestra is a friendly adult amateur orchestra based in Leicester. It was originally founded by Anne Dixon to whom we are most grateful for her vision and dedication. We aim to give musicians the opportunity to play and perform classical & more contemporary popular pieces in a friendly and sociable environment. Whilst we strive to always improve our playing and individual skills we also believe that playing music should be fun with more emphasis on the rehearsals than public performances. We welcome new players from the more experienced, those that maybe wish to revive old skills and those who have begun to play more recently but not beginners. There are no formal auditions. All that we ask is that you can cope with the music, feel reasonably comfortable sight reading and are able to regularly attend rehearsals. So if you are an adult, play an instrument in the above sections and are interested in playing with The Clarendon Park Orchestra please get in touch. We can then confirm that our rehearsal schedule has not altered and hopefully you can pop along and join in one of our rehearsals. If you play another instrument please also get in touch and we can keep you notified if vacancies arise. A small subscription is payable of £30 per term (£20 concession) which helps to cover our venue costs. Our Conductor David Calow is renowned for his expertise with a number of local orchestras and ensembles including conducting the Bardi Wind Orchestra, Rutland Sinfonia, Warwick Orchestral Winds and Musicamici wind ensemble.